The week before the 2018 Calgary Stampede, Past President and Chairman of the Stampede Board of Directors, Bob Thompson took time out of his busy schedule to speak with me. You could say that Bob had the dubious honor of holding that role in what might go down as the toughest year in Stampede history. That was 2013, the year the Bow and Elbow Rivers flooded downtown Calgary and the entire grounds fourteen days before the Stampede was set to open. For an event that typically takes weeks to set up, replacing all the sand in the racetrack, rodeo infield and arenas along with cleaning flooded buildings were added to the list. In his 25 years with the Calgary Stampede, 10 years on the rodeo & chuckwagon committees and 15 on the board of Directors, I expect those 14 days were the toughest in his tenure. Bob called it “a pretty miraculous effort”. Bob also founded Brownstone Asset Management an investment management service. He currently sits as a Chair of the Calgary Stampede Foundation and was a past Director of the Saddledome Foundation. In 2012 Bob received the Queen Elizabeth II Diamond Jubilee Medal in honor of his significant Contributions and Achievements by a Canadian. Being animals of fear horses are constantly evaluating risk. Whether you are approaching a creek or approaching a strange obstacle they are approaching it from the perspective of risk. Horses are pretty good at evaluating risk from their dimension. I think that it helps me when I’m riding to understand a horse’s mind as it navigates to where ever we’re going and it does it from a risk perspective. I’ve always found that interesting, as when you approach a business problem one of your main jobs is the proper evaluation of risk. NL – How do you think that understanding the horses perspective helps you manage risk? Do you see it as being the same as how an entrepreneur has to evaluate risk? BT – It’s a couple of things. As a rider you are picking your moments of risk as well as you are evaluating things, deciding when to go ahead either more or less aggressively. Say it’s a deep muddy creek – whether you move the horse through a situation it’s not comfortable with or not. When you determine if you do or don’t go. In business it’s the same thing whether you do or don’t go, you have to make a firm decision. It’s like the old expression: “Never say whoa in a mud hole.” – when you are in a business deal you have to make the decision, you do that from being able to evaluate risk. NL How do you support those around you that don’t see risk as clearly as you do? BT – A lot of people are risk adverse. I like to encourage people to take risk, I don’t mean taking silly risks. For example with the CS you encounter many many situations where you have to make a decision to go forward. I tend to encourage people to understand risk and to look at themselves when they try to propose something – to put the risk and reward concept on the table and look at it. NL – When you say encourage it: Do you find yourself asking questions? BT – You always have to ask questions. You gather the information and try and look through the excessive amount of detail or the fog that might surround things to see the endpoint more clearly. When you’re riding it’s standard riding skillset. When you are galloping you need to be looking at your destination, notion of seeing through all that may be going on around you at the every moment. Understand the risk, reward around a situation I try to support them through understanding what it’s about. NL – A lot of people might want to look for the holes, but you have to trust the horse and missing the holes is their job. Some people have a hard time letting that go. BT – There is a lot of holes on this property but you have to let the horses do their job. NL – From your experience with horses, do you feel you pick up on the subtleties of people better? BT – Horses sure do. I’m no expert but I’ve watched guys who see stuff I don’t even see when it comes to communicating with horses. You can’t help but believe that transpires with humans. There is a lot of literature written on communicating with your horse. I think it’s true whether you are working with horses or humans, it’s about trying to sort out the communication bit. When you approach a horse you don’t know, you are evaluating the horse, as the horse is evaluating you. It’s the same when you approach humans you are always assessing them and they you. NL – How does that experience and learning transpire into what you do as a leader, entrepreneur, as a leader of the CS? BT – The other side of risk is the reward feature. You don’t just go through life mitigating risk, it is a huge part of what you do as a leader but the other side of risk is reward. So the second part is how you go about maintaining patience through that. It’s pretty common knowledge that you have to maintain your patience with horses, even if you’re an impatient person. Rushing things with horses never seems to work well. So horses help you develop patience. You have to otherwise you end up in a lot of wrecks. If you are in a big hurry because you didn’t leave yourself enough time, and you’re trying to jam the horse into the trailer or you’re throwing stuff in a hurry, if you want to get the right outcome and get to your friends place, you are forced to be patient whether you like it or not. Some people chose to be impatient with people and for some reason they think they are going to get somewhere. They believe they can change other peoples minds. If they were to apply the same degree of patience that you are required to do with horses. If they were to dig deep and find whatever scrap of patience they have in their DNA, you’ve got to pull it out and use it. Human’s don’t often do that with people they just be impatient and then they deal with the outcome. NL – Love that horse human anology – you may get the horse in to the trailer this time, but you might not the next time. With people they might comply but they also might have one foot out the door. NL – You began with risk because that is a huge part of business, life and horses that determines how resilient you are. If you fall off you have to get back on again. BT – It’s kind of that idea – it’s the small things. If you don’t take your time saddling a horse the risk is you might end up with a horse that is cinchy. Even the small things present a risk. Horses are always managing their risk and how you interact with them also determines your risk. There is always your managing how you create risk in the relationship. NL – If there was one thing that other people could get from working with horses. BT – Well I think, depending if they’ve never delt with horses it takes them out of their comfort zone. Too many people live their lives in their comfort zone. That’s where you get more out of life, when you hit those points of discomfort, when you’re uncomfortable you shake it off and think that was fantastic. Why was I so scared. You are teaching people to step outside of their comfort zone given a horse’s size they could pose a looming threat. I’ve known many people who always prefer to say no over yes because they are worried to embarrass themselves or their afraid they can’t handle it, they are worried for a whole bunch of reasons not to go forth with something. Get close to them, push them out of their comfort zone its got to be good for their mental health. Thanks Bob, apologies it took so long to get this posted. It was a pleasure chatting with you and I look forward to our trails crossing again. 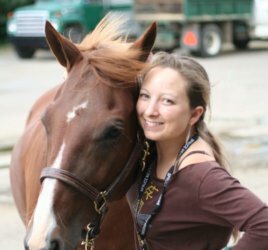 Nancy Lowery has been blogging about her Leadership Learning through Horsemanship Experiences for over ten years. 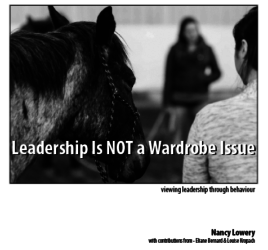 This series began as “One Foot in the Arena” exploring what other leaders in Calgary have learned about their leadership through their relationships with horses. 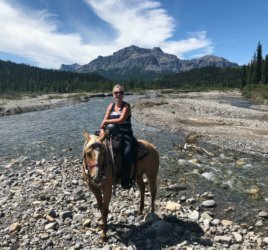 To explore how a day with horses can complement your Leadership Training programs Nancy would love to hear from you. @sprawlcalgary a disconcerting series of events - online vandalism! 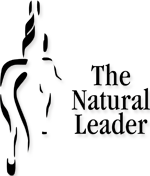 Sign up for our newsletter and keep up to date on The Natural Leader.